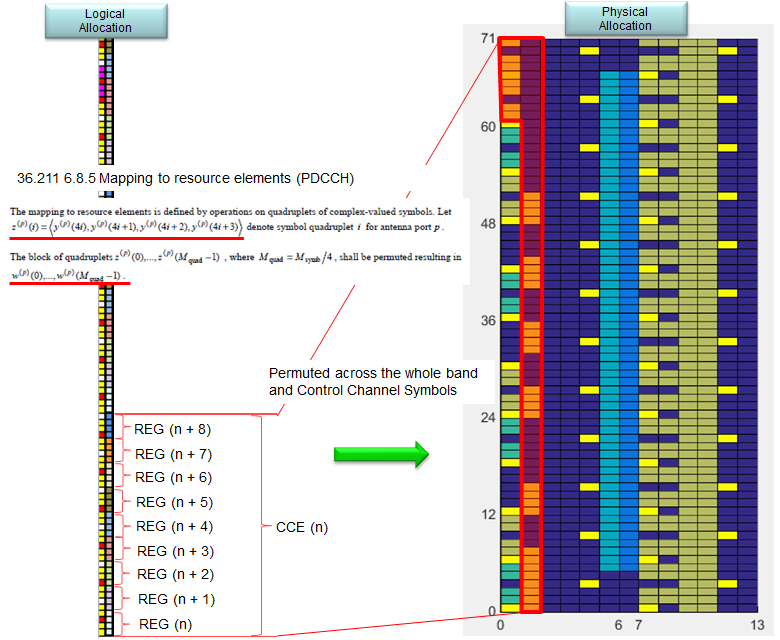 Reading various LTE specification, you will see many terms which seems to be related to resource allocation but looks very confusing. At least you have to clearly understand the following units. Resource Element(RE) : The smallest unit made up of 1 symbol x 1 subcarrier. RB (Resource Block) : I think everybody would know what this is. This is a unit of 84 resource elements which is 12 subcarrier by 7 symbols (This is with normal Cylic Prefix which is used in most of the LTE deployment. If it is with Extended Cyclic Prefix, the number of symbols within a subframe become 6 and the number of resource elements in a single RB become 72). Following is the overall procedure to number from RE to Aggregation Level. iv) group CCE according to Aggregation level (let's call this group as a 'CCE Bundle'). We use these units in hierachical manner depending on whether it is for control channel or data channel. The above illustration would look straightforward but may be a little bit misleading. You may think of the REG arrangement within a CCE is a kind of logical assignment, not physical assignement. The REG arrangement within a CCE is arranged in consecutive manner, but in real (physicall) allocation, the REGs in a CCE get permutated and scattered across the whole bandwidth and control channel symbol as illustrated below. For further details of physical allocation of REG in control channel, refer to following links. ==> I think a couple of example would give you more practical understanding. Resource Allocation : Network would allocate the DCI 1 spreaded over CCE4, CCE5. Resource Allocation : Network would allocate the DCI 1 spreaded over CCE4, CCE5 and allocate the DCI 0 spreaded over CCE6, CCE7. Resource Allocation : Network would allocate the DCI 1 spreaded over CCE4, CCE5 and allocate the DCI 0 spreaded over CCE6, CCE7 and allocate two CCE for DCI 3 but DCI 3 would be allocated to a common search space (not to a user specific search space).